Some of our most successful portfolio companies are household names and get tremendous coverage in the press. Others are equally successful but have done it quietly, mostly under the radar of the the media and the blogosphere. The poster child for the second group is Indeed. Over the past couple years, Indeed has emerged as the top jobs site on the global web. This is comscore data below. 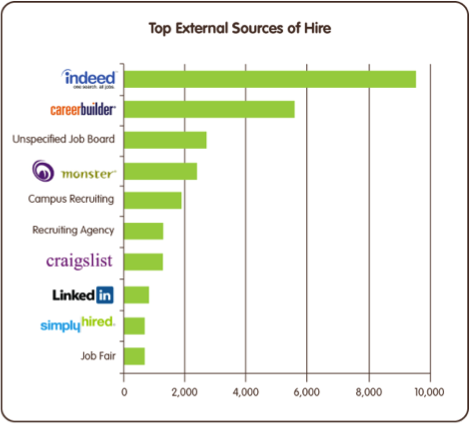 But even more impressive is the fact that Indeed drives more hiring than any other web service. One of the leading applicant tracking services, Silk Road, did a survey using real ATS data from 700 of their clients and here are the results. So not only has Indeed surpassed the leading job sites in terms of usage, it has also surpassed them in terms of sourcing hires, which is the whole purpose of these services. And they've done this without much fanfare, without much notice, but with flawless execution and a great service. Well done Indeed.